Binding gold nanoparticles to a specific antibody for cancer cells could make cancer detection much easier, suggests research at the Georgia Institute of Technology and the University of California at San Francisco (UCSF). The report is published online as an ASAP article in the journal Nano Letters. Many cancer cells have a protein, known as Epidermal Growth Factor Receptor (EFGR), all over their surface, while healthy cells typically do not express the protein as strongly. By conjugating, or binding, the gold nanoparticles to an antibody for EFGR, suitably named anti-EFGR, researchers were able to get the nanoparticles to attach themselves to the cancer cells. In the study, researchers found that the gold nanoparticles have 600 percent greater affinity for cancer cells than for noncancerous cells. The particles that worked the best were 35 nanometers in size. Researchers tested their technique using cell cultures of two different types of oral cancer and one nonmalignant cell line. 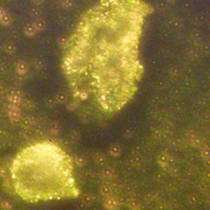 The shape of the strong absorption spectrum of the gold nanoparticles are also found to distinguish between cancer cells and noncancerous cells. What makes this technique so promising, said El-Sayed, is that it doesn’t require expensive high-powered microscopes or lasers to view the results, as other techniques require. All it takes is a simple, inexpensive microscope and white light. Another benefit is that the results are instantaneous. “If you take cells from a cancer stricken tissue and spray them with these gold nanoparticles that have this antibody you can see the results immediately. The scattering is so strong that you can detect a single particle,” said El-Sayed. Finally, the technique isn’t toxic to human cells. A similar technique using artificial atoms known as Quantum Dots uses semiconductor crystals to mark cancer cells, but the semiconductor material is potentially toxic to the cells and humans. The research team consisted of El-Sayed, along with his son Ivan El-Sayed, head and neck surgeon at the UCSF Comprehensive Cancer Center and Tech graduate student Xiaohua Huang.